- Prim + Preux Adult 5.3 ounce Vision Henley. - 5.3 ounce 95/5% cotton/spandex fabric. - UPF 30+ (white is not applicable). - Clean finished placket with color matched trim in the inside of placket. - Two piece self fabric cadet collar. - Three color matched buttons, but pearlized buttons on light colors, white and blossom. 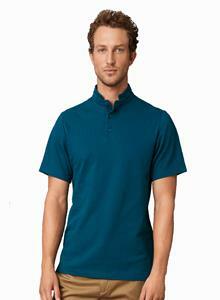 Prim + Preux Adult 5.3 ounce Vision Henley. 5.3 ounce 95/5% cotton/spandex fabric. UPF 30+ (white is not applicable). Clean finished placket with color matched trim in the inside of placket. Side seam with self fabric face side vents. Woven label. Two piece self fabric cadet collar. Three color matched buttons, but pearlized buttons on light colors, white and blossom. Rolled shoulder. Sizes: S-3XL. Colors: White., Black, Blossom, Legion Blue. Style ships from Jurupa Valley, CA. AVAILABILITY NOT EXPECTED UNTIL MARCH 2019.